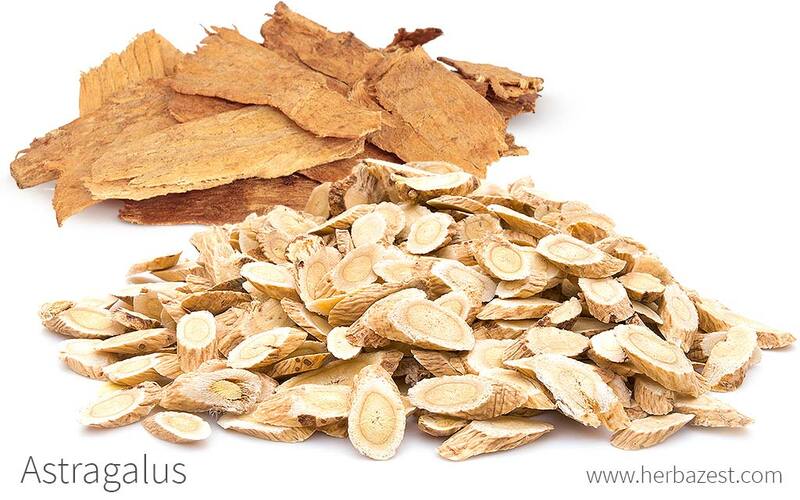 Astragalus has a long history in traditional Chinese medicine, and is considered one of the 12 most important herbs in traditional Chinese medicine. Astragalus has a long history of use by the tenets of Traditional Chinese Medicine (TCM) although it remains largely unfamiliar to the Western world. Astragalus has traditionally been thought to improve wei qi or chi, which means "life force" or "energy flow". Its popularity spread to have many different uses throughout the country's history, but it was not the subject of scientific study or even commercial use until the 1980s. Nowadays, conventional medicine is interested in astragalus potential applications, while its traditional uses remain as strong as ever. Treating bacterial and viral infections. Astragalus contains antioxidants, which not only work to prevent infections, but allows for quick recovery. Stimulating appetite. Astragalus supports the immune system in a number of ways, including improving digestive health, which in turn stimulates appetite. Lowering the risk of metabolic syndrome. Astragalus is thought to lower the risk of metabolic syndrome, a cluster of conditions (high blood pressure, high blood sugar, excessive body fat, etc.) that can lead to heart disease, stroke, or diabetes. Treating skin wounds. When applied topically, astragalus is thought to treat minor wounds, such as burns, sunburns, cuts, and skin abrasions through its antibacterial properties. Improving cardiovascular health. Because of its antioxidant properties, astragalus may improve cardiovascular health and may even prevent heart disease. Lessening the negative effects of chemotherapy. Studies have found that astragalus can potentially lessen the negative side effects of chemotherapy by boosting the immune system. However, further research is needed to confirm this. Strengthening the immune system. In ancient China, astragalus was used for strengthening the immune system, a practice known as strengthening qi (“chee”). Treating tumors. In ancient European and Arabic medicine, astragalus was used to treat tumors in the eye, liver and throat. Relieving chronic pain. In certain Native American tribes, such as the Lakotas, they grinded up the roots and used it to relieve chronic pain. The main active ingredient is astragalus polysacharin (APS), and most of the medicinal applications attributed to astragalus are believed to come from it. APS (also known as astragalus polysaccharide) has been shown to activate the immune system by enhancing the transformation of T lymphocytes (a sub-type of white blood cells, crucial in the regulation of immune responses), as well as the activation of B lymphocytes (which produce antibodies that are used to attack invading bacteria, viruses, and toxins) and dendritic cells, which trigger immune reactions to toxins. Astragalus-based treatments have been shown to effectively reduce the toxicity induced by drugs commonly used for immune disorders and chemotherapy. Other chemical compounds that give astragalus its substantive medicinal properties include polysaccharides, four major isoflavonoids (formononetin, ononin, calycosin, and its glycoside), saponins, several minor isoflavonoids, and other biogenic amines, all of which have a positive effect on managing stress and stimulating the immune system. Astragalus also contains triterpenoids, which may contribute to ameliorate the negative side effects of chemotherapy. Astragalus constituents, particularly the flavonoids, exert significant cellular antioxidant effects, which positively affect the immune system in a number of ways. The numerous flavonoids found in astragalus appear to enhance cell-mediated immunity by increasing the number of T-helper cell type 2 cytokines, increasing levels of tumor necrosis factor and interleukin-6, which stimulates the activity of macrophages, responsible for killing potentially harmful cells. Additionally, astragalus contains sucrose and saponin, as well as high concentrations of amino acids, selenium, zinc, copper, and vitamin B9 (folic acid). Similar antimicrobial properties can be found in lemon balm and calendula, whereas gentian and dandelion are also great appetite stimulants. Astragalus is safe for most adults to consume orally, as well as apply topically. Very little is known about its potential side effects, since it is often combined with other herbs when used medicinally. Other species from of the Astragalus genus have been found to possess trace amounts of a neurotoxin called swainsonine. However, no such evidence has emerged so far regarding Astragalus membranaceus, which is the species most used for medicinal purposes. Those who take immunosuppressant medications should use caution when taking astragalus, since it can negatively interact with them. Individuals who suffer from diabetes or need to regularly monitor their blood sugar levels should exercise caution when taking astragalus, since it can lower blood sugar levels. Astragalus can inhibit the body's ability to expel lithium, allowing accumulation of this chemical in the system. Those who are taking lithium medication should consult with a physician before taking astragalus. Women who are pregnant or breastfeeding should consult a physician before taking astragalus. The most significant part of the herb is its extensive root system, which is the part that is dried and prepared medicinally. 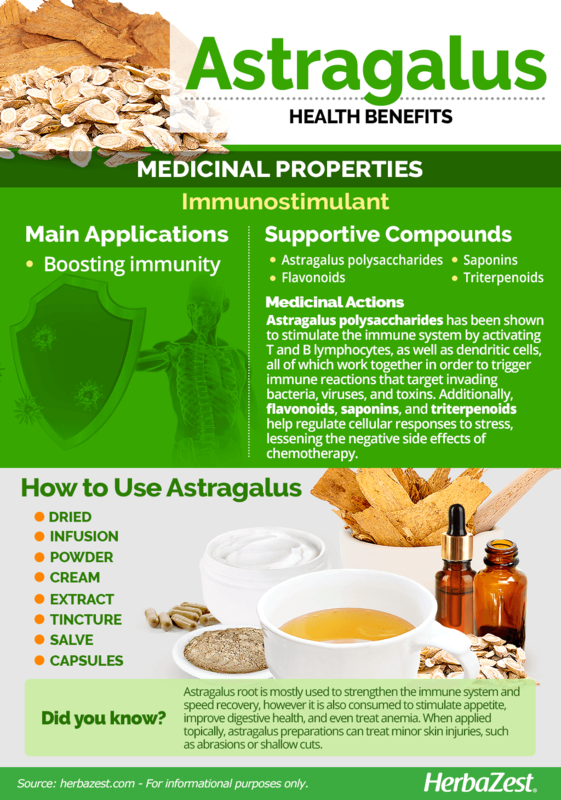 The most effective way of obtaining the health benefits from astragalus is in its numerous medicinal forms of consumption, where the properties of the plant are more concentrated. Raw. It its natural form, the root is typically ground up and used medicinally. It is consumed to stimulate both appetite and the immune system. Infusion. When brewed into a hot tea, astragalus have numerous health benefits. Some of these include stimulating appetite and improving digestive health. Powder. Astragalus powder, which can be added to smoothies or other liquids can be consumed to treat anemia. Cream. When applied topically, astragalus creams can soothe sunburns and other minor skin injuries, such as bruises and contusions. Extract. In this medicinal form, astragalus con stimulate the immune system, even lessening the negative side effects associated with chemotherapy. Tincture. When macerated in a neutral alcohol, astragalus is transformed into a concentrated solution, which can be taken diluted in water to strengthen immune system and cardiovascular function. Salve. When applied topically, astragalus ointments can treat minor wounds, such as abrasions or shallow cuts due to its antibacterial properties. Capsules. This is one of the most common medicinal forms of astragalus. Capsules stimulate appetite, as well as lower the risk of metabolic syndrome due to its numerous flavonoids. Fresh astragalus can be difficult to find outside its native region, but specialized health stores and ethnic markets may carry the root, either dried or powdered. Certain wholesale retailers also offer the herb as a tea, generally blending it with other tea leaves for a fuller-bodied flavor. CERTAIN WHOLESALE RETAILERS ALSO OFFER THE HERB AS A TEA, GENERALLY BLENDING IT WITH OTHER TEA LEAVES FOR A FULLER-BODIED FLAVOR. Astragalus supplements are in a much greater supply worldwide, because trace amounts of the herb have great effects and consistent doses make for less guesswork on the part of the consumer. Standardized liquid extracts are the most extensively available, though ointments and tinctures also exist. Specialized herbal stores and online retailers are the best resources for a large selection of brands and prices. As a perennial flowering plant, it can handle temporary frost, but ideal temperatures should hover around 70°F (21°C). Grown from scratch, seeds should be scarified - partially slit open through the outer layer - to accelerate germination. Astragalus seeds require a 21-day cold period of stratification to promote germination, followed by mild scarification with fine-grade sandpaper. It is best to avoid transplanting whenever possible, because the roots are very fragile until the plant has reached four to five years of growth. It takes at least two years of growth before it can be harvested for medicinal purposes. Scientifically known as Astragalus membranaceus (also A. propinquuss), astragalus stands an average of 16 - 36 inches (33 - 91 cm) tall and features several pairs of opposing leaflets down the length of its hairy stems. The primary root is thick and long with many lateral roots. The secondary root system begins 8 - 12 inches (20 - 30 cm) below the soil surface and can attain 60 inches (150 cm) in width. Rhizobium nodules develop on the upper portions of the roots near the soil surface. Astragalus's flowers, when in bloom, range from yellow to purple in color, and it produces fleshy seedpods instead of fruit. Astragalus membranaceus is a member of the Fabaceae family, which comprises about 17,000 species across 700 genera, including economically important crops such as alfalfa (Medicago sativa), beans (Phaseolus vulgaris), fenugreek (Trigonella foenum-graecum), soy (Glycine max), and tamarind (Tamarindus Indica). With over 3,000 species, Astragalus genus is one of the largest known. However, it is not a common ornamental plant, and is not widespread throughout the world. There are few varieties and no subspecies to speak of that differ from the original. It is often, however, confused with other members of its genus, most notably with tragacanth (Astragalus tragacanthus), a Middle Eastern legume used to make a natural gum. Considered one of the important Qi' tonifying or immune stimulant herbs, astragalus has been integral for CTM since 200 BCE and is thought to be one of the oldest plants used medicinally. It was prescribed for balancing the immune system in cases of general debility and chronic illness. It was used to strengthen vitality in the immune system. In ancient China, this practice was known as strengthening Qi (pronounced chee), the body's life force and protective energy. The Chinese name for astragalus is Huang Qi, which translates to yellow leader, referring to its yellow roots and its status as one of the most important tonic herbs. Though astragalus is still lesser known outside of Asia, the internal market for the herb is quite robust - China's economic demand for the plant topped one million tons in 2008 and was set to increase in future years. Deforestation has made it an expensive commodity, and that same year only saw a yield of 500,000 - 600,000 tons, signaling a need to find new ways to increase production and repopulation efforts. Environmental. In the wild, astragalus is a food source for insects and other herbivorous wildlife. Veterinary medicine. Research has recently found that astragalus can help improve dogs' suppressed immune systems.